Reviewing a widely acclaimed record several weeks after its release always presents its own unique challenge. 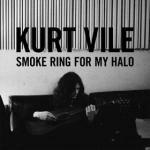 As I sit down to write this critique on Kurt Vile’s Smoke Ring For My Halo, I find myself wondering how can I say something new about an album that has already been discussed to death, especially when I wholeheartedly agree with the general consensus. Then I remember: it wasn’t always this way. There was a time when I considered Kurt Vile an overhyped flash in the pan, whose gauzy bedroom music constituted the bitter dregs of lo-fi’s increasingly stale barrel. In retrospect, I don’t even know how I arrived at this opinion. I must have sampled Vile’s music on the bad day to end all bad days. 2008’s Constant Hitmaker isn’t a perfect debut by any stretch of the imagination, but standout tracks Breathin Out and Don’t Get Cute are both strong enough to burst through the haze and suggest an unrealised potential. Having (prematurely) written him off, I didn’t pay too much attention to Vile’s next two full-lengths and it wasn’t until I read the glowing write-ups for Smoke Ring For My Halo that I thought a reappraisal might be in order. It took three or four listens for me to soften my views on Vile, and a few more for Smoke Ring For My Halo to truly win me over. I usually forge opinions over a relative short period of time, so this was a pretty unusual situation for me. The reason for my uncharacteristic persistence? A combination of Jesus Fever’s sheer brilliance and my own trademark laziness - I either kept forgetting to turn the album off or simply didn’t have anything else with me to listen to. After a few weeks, I realised that a subtle shift had occurred: now I didn’t want to listen to anything else. On Tour was the second track to make its mark and in doing so, it opened the floodgates for the rest of Smoke Ring For My Halo to follow. On paper it’s not much more than a selection of loosely described observations, vaguely inspired by the touring lifestyle, delivered in a lethargic drawl over a lazily strummed guitar. The fact that Vile manages to maintain our interest over five and a half minutes of this is testament to his tremendous ability to do al lot with very little. This is a recurring theme on other album standouts Peeping Tomboy and Society Is My Friend. Legendary producer John Agnello has helped Vile to refine his lo-fi aesthetic and at times Smoke Ring For My Halo sounds nothing short of stunning. It’s still vaguely psychedelic, yes, and the same adjectives (woozy, fuzzy, hypnotic) apply, but this is undoubtedly the first Kurt Vile record that sounds like a studio creation as opposed to a bedroom one. This is a sensible step for many reasons. Firstly, I don’t think an artist on an influential and highly supportive independent label like Matador can continually justify making albums that sound like they were recorded on a scratchy old four track machine. Secondly, critics and bloggers tend to focus a lot of their attention on new artists and new scenes, meaning that veterans like Vile need to broaden their horizons to appeal to the wider music-loving public. There’s also the simple fact that the blogosphere has absorbed an awful lot of poorly recorded D.I.Y music over the last five years. Smoke Ring For My Halo might not be for everyone, but it will definitely find a wider audience than anything else in Vile’s catalogue. It has already been hailed as a breakthrough, which I suppose it is in a relative sense, but I would describe it as more of a transitional point in Vile’s career. His next step should be the truly interesting one, and having been proved completely wrong by this sensational album, I know I’ll be awaiting it with eager anticipation.